We know that cement possesses faster rate of hydration in hot weather. The rate of hydration of cement increases with the increases in temperature. Generally, 10° C – 27° C is considered as most suitable for hydration. At higher temperature, the concrete may start to set before placing and compacting in position. Therefore the concrete should be placed as fast as possible after mixing. During concreting in hot climatic condition, the concrete may have to be cooled to protect from ill effects. To achieve this, cooled water and aggregates can be used while preparing the concrete. 1. The main aim is to decrease the temperature of the concrete itself and furthermore the forms where it will be placed. 2. If possible, mixer machine should be installed below the shade. 3. 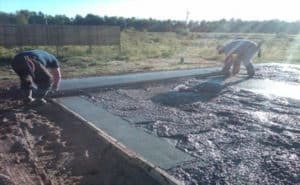 If concrete is to be transported to a longer distance, concreting materials may be mixed first in dry condition and the water may be included at the job site just before placing the concrete in position. 4. To protect the water content from evaporation, always deep containers should be used for the transportation of concrete. 5. After placing, wet burlap should be used to cover the concrete. It will help to protect coolness and moisture of concrete. 6. Curing should be started immediately as soon as the concrete starts hardening. 7. Retarding admixtures can also be used while adding the water in the mix to slow down the setting action of concrete. 8. Ice cubes or refrigerator can be used to cool the water to be used. But ensure that ice cubes are totally melted and there are no solid ice crystals present in the concrete. Also Read – Cold Weather Concreting.